Augusta Raiklin, 79, a former resident of Highland for two years and Grahamsville for eleven years, passed away Monday, February 4, 2019, at her daughter’s home in Hyde Park (where she resided for the past year) with her family by her side. Born in Khabarovsk, Russia on June 16, 1939, she was the daughter of the late Ivan and Tatiana Tutunikov. A homemaker, Augusta was a loving wife, mother and grandmother. She was known for her generosity, her hospitality and her infectiously warm smile. In October 1969 in Leningrad, Russia, she married Ernest G. Raiklin. He predeceased her on January 2, 2018. Ernest and Augusta immigrated from Russia to the United States in 1974 with three of their four children. Their youngest was born two years later in New York City. In 1981, Augusta was naturalized and became a citizen of the United States. 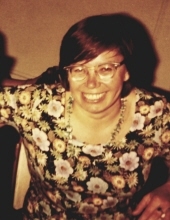 Survivors include her four children, Maria Hoskins and longtime companion, Fred Boardman, of Hyde Park, Paula Banuelos and husband, David, of El Paso, TX, Ben Raiklin, and wife, Yulia, of Madison, WI, and Ivan Raiklin, and wife, Elena, of Alexandria, VA; six grandsons; and one granddaughter. In keeping with her wishes, cremation has taken place. Memorial calling hours will be from 10 am to 2 pm, Saturday, February 9that Sweet’s Funeral Home, Rte. 9, Hyde Park. A reception will follow. A family celebration of her life will take place at 12 noon during the visitation. Burial of her ashes will be private and at the convenience of the family. For those who wish, memorial donations may be made to the Hudson Valley Hospice, 374 Violet Ave., Poughkeepsie, NY 12601. (www.hvhospice.org) To send an online condolence, or for directions, please visit www.sweetsfuneralhome.com. To plant a tree in memory of Augusta Raiklin, please visit our Tribute Store. "Email Address" would like to share the life celebration of Augusta Raiklin. Click on the "link" to go to share a favorite memory or leave a condolence message for the family.